BRIGHTON & Hove Albion coaches were special guests of Derry & District Youth FA. club, Foyle Harps last weekend as the progressive local club continues to forge strong links with the English Premiership outfit. Derry City has also made promising connections with the club through former Seagulls’ player, Paddy McCourt - the Candy Stripes’ Youth Academy Director and his brother, Leroy who is employed as a full-time Irish scout for Brighton. The English club accepted an invite from Foyle Harps to come to Derry and take their various youth teams through their paces at Leafair football pitches while they watched Derry City’s Under-13s come back to clinch a 2-2 draw against Sligo Rovers at Aileach on Saturday in the FAI’s inaugural U13 league. Coaches, Pat Rocks and Stuart Lawrence were Harps’ guests on Foyleside and they were hugely impressed with the standard of football on display during their visit, admitting they had their eye on several young stars of the future. Lawrence, Brighton’s grassroots coach and talent scout was invited onto the pitch at Brandywell at half-time during the 2-0 win over Sligo Rovers on Friday and was presented with a special, signed Derry City shirt by McCourt with the number 26 on the back, representing the 26th anniversary of his brother’s death. Stephen Lawrence was brutally murdered in an unprovoked, racially motivated attack while waiting for a bus in south East London on April 1993. He was clearly taken back by the kind gesture as it approaches the first ever official Stephen Lawrence Day on April 22nd - a national day of commemoration in England held on the anniversary of Stephen’s murder - and he’s promising to return to Foyleside and strengthen the connections he’s made during his short trip. There have been attempts in the past by Derry City to forge links with Celtic and Brighton could potentially be a relationship to develop for City boss, Declan Devine and his coaching staff. It’s an another example of how the club can make the most of its Academy Director’s many cross-Channel contacts as the ‘Derry Pele’ quite clearly left his mark on numerous clubs from Glasgow to Brighton during a stellar career. Current Brighton loanee, Josh Kerr has been the product of that blossoming relationship between the two clubs who obviously see the benefit of loaning their underage players to Irish clubs to get much needed senior football experience, given they’ve also allowed striker James Tilly to join Cork City this year. 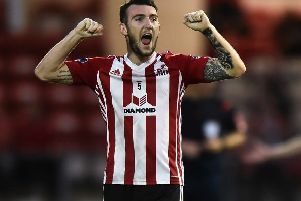 It should be something Derry are keen to develop in the future and Brighton coach Patrick Rocks, who hails from Cork, certainly thinks it’s something to consider. “Josh Kerr is over here and we have the big man, Shane Duffy. We’re always delighted to have him at the back and with Josh coming over, it has strengthened the link between the clubs,” said Rocks, a former Cyrstal Palace youth coach who has been working with the Seagulls for the past five years. The Brighton coaches didn’t get to see too much of Kerr on this occasion as he came on for the final minute of stoppage time against Sligo Rovers as Devine attempted to shut up shop. However, the main purpose of their trip was to scout potential talent for their employers at the Amex Arena. It’s the third time Foyle Harps have invited Brighton over to Derry and Rocks insists this latest trip proved worthwhile with several young players catching his eye. “It’s great the welcome we get over here. The people are great and it’s always producing great players. We don’t come over too much. We only pick and choose by invitation really. It’s mainly our own academy in London which we’re concentrating on the underage and obviously we’re building links here. And his coaching colleague, Lawrence, echoed those sentiments, revealing his intention to follow up on recommendations made by Leroy McCourt. “We did sessions with the U10s, U11s, U13s and U16s and the standard is really, really good. The boys and girls really enjoyed the coaching, It’s very much a development environment here at Foyle Harps. The standard at Brighton is really high and some of the boys have been with us from the age of nine. To have access to the knowledge and expertise of an established Premiership club will no doubt be hugely beneficial to Foyle Harps in the coming years and Harps coaches, including club legend, Gerry ‘Doc’ Doherty must be commended.